Non-operating REAs offering electricity contracts for members in collaboration with an electricity marketer who operates in their territory. If you live in a REA service area, you must enter into a Member Service Contract with that REA before you can obtain electrical service. As a member of an REA, you can choose to purchase your electricity at the REA’s regulated rate for the amount outlined in a contract with your REA or an electricity marketer operating in your area. With questions or concerns about your REA services, you can contact your REA office. Alberta Federation of Rural Electrification Associations (AFREA) website lists the contact information for the member Rural Electrification Associations. 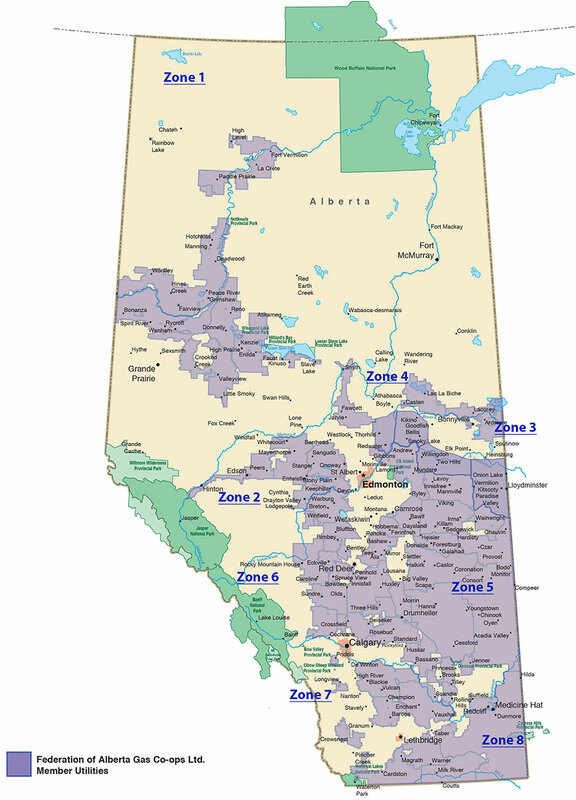 The following REAs are not affiliated with the Alberta Federation of Rural Electrification Associations: Armena REA Ltd., EQUS REA Ltd., Montana REA Ltd., Myrnam REA Ltd., Peigan REA Ltd., West Wetaskiwin REA Ltd., Wild Rose REA Ltd. , Zawale REA Ltd.
A rural gas co-op (co-op) is a not-for-profit cooperative that owns its own distribution system and supplies natural gas to members in rural areas. According to the Federation of Alberta Gas Co-ops, gas co-ops in the province supply over 25 million gigajoules of gas annually to over 165,000 customers and own over 100,000 km of pipe lines. Unlike investor-owned utilities, rural gas co-operatives are free to set their own competitive pricing and answer to their members. If you buy your natural gas from a rural natural gas co-operative, you do not have the option of signing a contract with other natural gas retailers unless you are a non-farm consumer who uses more than 10,000 GJ annually. The natural gas co-ops in Alberta operate collectively under the Federation of Alberta Gas Co-Ops Ltd. Please contact the Federation of Alberta Gas Co-ops if you are looking for gas co-op contact information in your area. If you have questions or concerns about your local natural gas co-operative, contact your co-op administration. Gas Co-ops and the REAs fall under the mandate of the Rural Utilities Act. The Rural Utilities Branch of Alberta Agriculture and Forestry is responsible for review of this Act. The Ministry is also responsible for ensuring the safe and orderly development of natural gas distribution systems, conducting technical reviews, issuing approvals, development of policy issues respecting rural gas utility operations and business practices and regulation of gas co-ops.